Wood dust irritates your eyes, nose and throat. It is a threat to lung function, has been shown to cause asthma and is increasingly being proved to be a carcinogen. 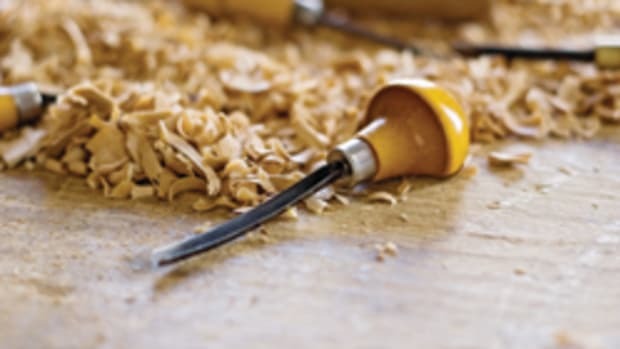 It also causes fires, explosions, even slippery floors in the woodshop, and can play havoc with finishes. Methods used to control it are usually referred to as dust collection “systems,” and that last word is important. 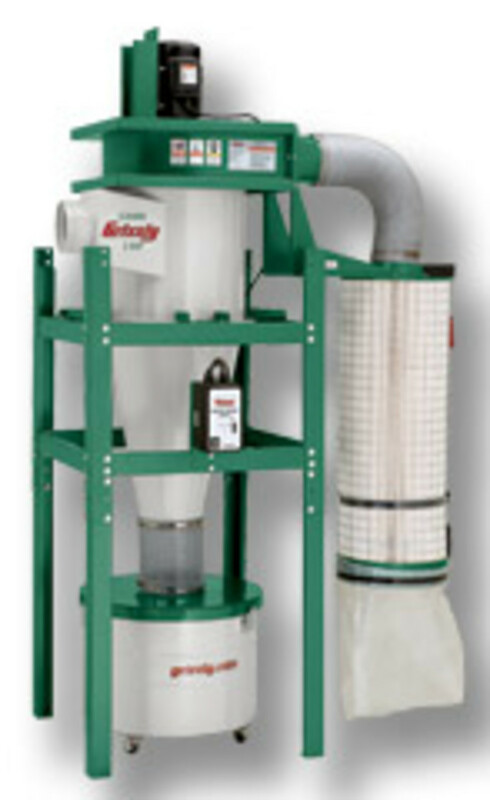 A dust collector alone, no matter how big, can’t handle all the debris created in a woodshop. 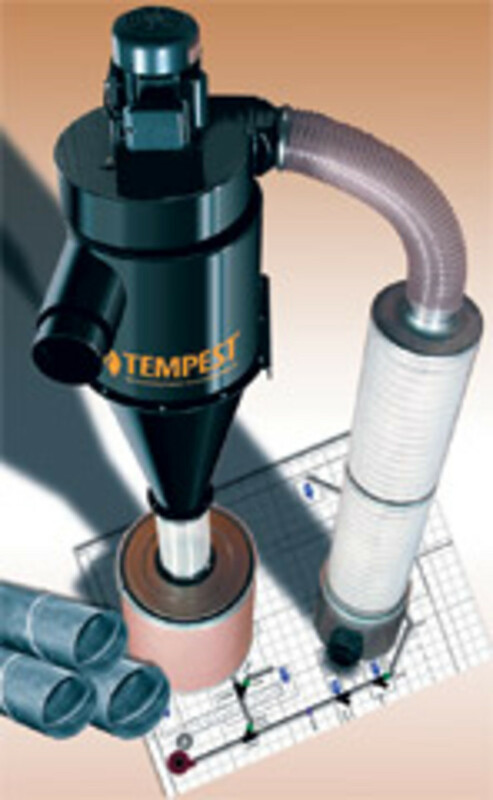 The elements of a complete system are a dust collector and ductwork that are permanently attached to stationary machines; ceiling-mounted filtration units that scrub fine particles from the air; and downdraft tables or small mobile collectors that clean up after portable tools such as sanders and routers. Fine dust, too small to see, is a long-term threat, while volatile and visible dust is a more immediate hazard. 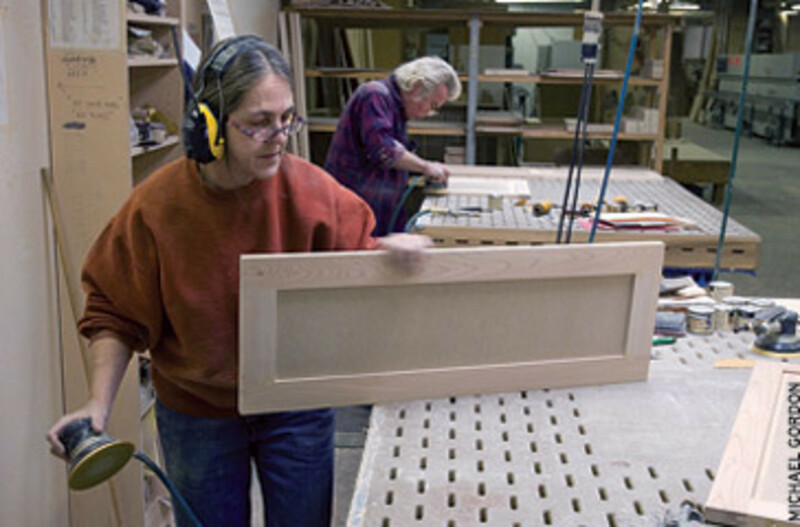 A woodshop manager needs to deal with both when upgrading an existing system or installing a new one. One’s impulse is to begin designing a system by choosing a central dust collector, but according to Oneida Air Systems, that’s actually the last decision to make. 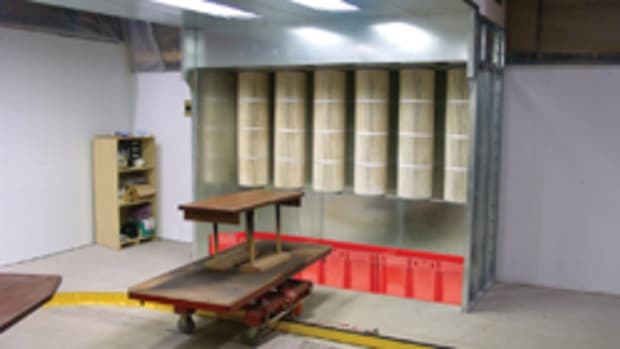 Their technicians determine the correct-size dust collector based on the size of the shop, the size and type of woodworking machines and the number of machines operating simultaneously. 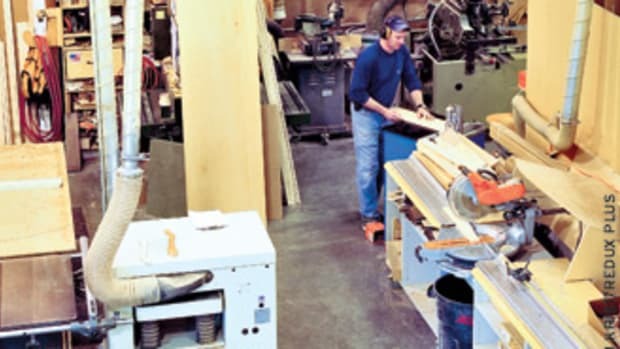 Each woodworking machine requires a certain amount of airflow (this volume is expressed in cubic feet per minute, or cfm) to efficiently collect both fine and gross particles. It’s usually listed in the owner’s manual. Most hobbyist machines are rated between 300 and 500 cfm, which will pick up chips. But the truth is that small home systems are often so inefficient that the true number is closer to 800 cfm when fine dust is included (which is about what OSHA regulations require.) Industry ratings say that at 4,000 feet per minute, a 4” duct can deliver 350 cfm and a 6” duct can handle around 785 cfm. 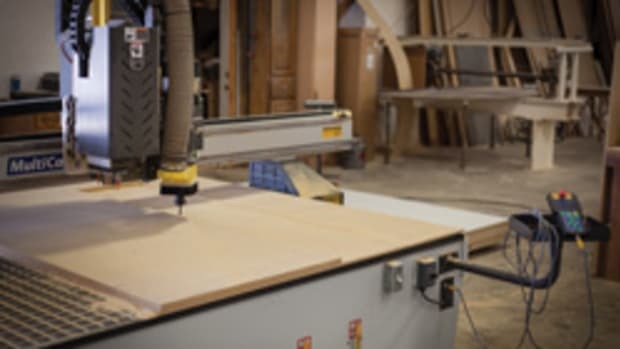 To stay in the airstream, woodshop dust and chips require air that is moving at a velocity of about 4,000 feet per minute. Once it is known how much airflow each machine needs, the appropriate ductwork can be designed with enough extra flow to counteract any resistance in the system. Resistance can be the result of obstacles such as cloth filters, bends in the ducts, flexible hose and even the smoothness of the inside surface of the pipe being used. To begin calculating, the next step is to draw a map showing the location of each machine in the shop, plus the intended location of the new central dust collector. This map should include the distance in feet from each machine to the collector. If possible, locate the collector closer to those machines that produce the largest debris (chips and shavings), as heavier waste won’t travel as easily through ducts as dust. 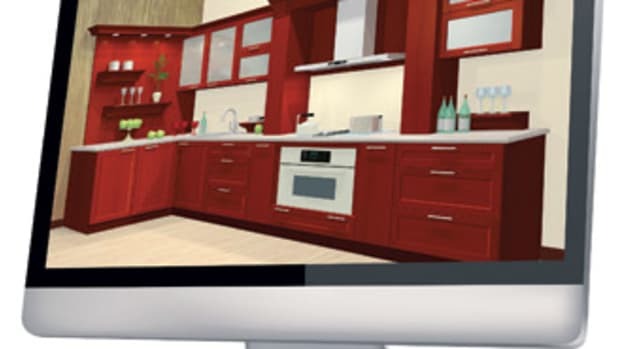 Another thing to keep in mind is if the machines are not already permanently installed, now is the time to think about zoning. That is, each type can be clustered: all the sanding, sawing or milling machines positioned close to each other. Then a single collection system with, say, three smaller motors can be used more efficiently and less expensively than one very large motor. That is, only part of the system needs to be running at any one time. Shop work habits play a role here if, for example, two kitchens are being built in the same space but at different rates of progress. Then all of the sanding might not be getting done at the same time. Manufacturers of dust collector units and ductwork usually have trained personnel on staff who handle the next step — the arithmetic. They take into consideration the required airflow, length of runs and resistance, and work out the static pressure and velocity lost along the way. Then they scale the pipes accordingly and come up with an optimum size for the central collector. That number determines which dust collector models can do the job, so it makes shopping for the unit a lot easier. There are a number of choices left to make. For example, do the numbers suggest whether the shop would be best served by a bag-house, cartridge or cyclone dust collector? There are no pat answers: each shop needs to be evaluated individually. For larger applications, manufacturers who provide all three types (such as Scientific Dust Collectors) will usually help with both ductwork design and collector recommendations. 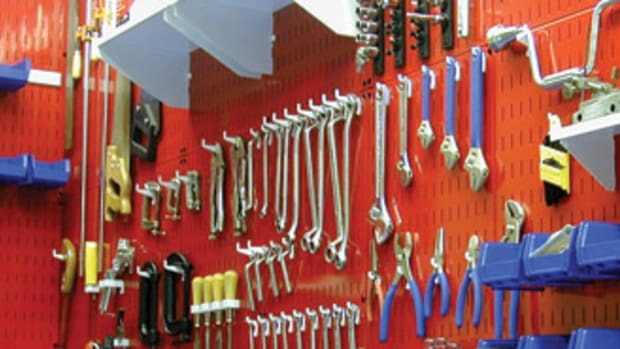 Small-shop systems are less complicated and can often be evaluated on the volume of air. For example, the UFO series from Cantek America includes models drawing 1,883 to 3,673 cfm, which is ideal in a smaller shop. General International offers a dozen models, both single- and two-stage, running the gamut from 1 hp (647 cfm) to 7-1/2 hp (4,955 cfm). 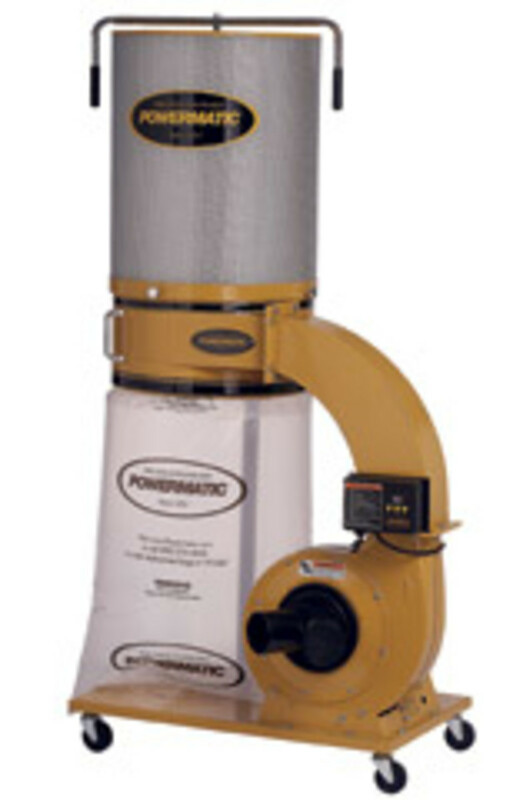 Powermatic has seven small dust collectors ranging from 1-3/4 hp to 3 hp (single and 3-phase), all featuring its exclusive TurboCone technology that was designed to improve chip separation to prevent clogging of the filter. And Grizzly offers 11 bag collectors and nine cyclones, all the way up to the 10-hp, 3-phase model G0638 that moves 4,029 cfm at 4.3” specific gravity, used in the industry to gauge the strength of a vacuum by measuring resistance. When comparing various models, check that the cfm ratings have been measured at the same specific gravity. Horsepower is not a great way to determine the strength of smaller dust collectors because it only describes the fan motor’s power and not all manufacturers measure in the same way. Plus the size and shape of the blades and the overall configuration of a collector (one-stage or two-stage, bags or canister, horizontal or vertical, cyclone) all play a role in how that horsepower is used. Commercial shops are usually required by fire codes to install galvanized metal ductwork, which is durable, easily grounded and professionally installed. Several companies such as Nordfab Ducting offer myriad fittings and duct options that can help maximize a collection system’s efficiency. Small shops often choose to use polyvinyl chloride (PVC) pipe, but check with a local building official before going this route, as it might not be approved. That’s because PVC is far more likely to create a static reserve (that is, build up static electricity until it discharges as a spark). It’s a good idea to consult an electrician for advice on grounding plastic. Sewer pipe is less expensive than schedule-40 water pipe. Fittings for PVC ductwork, such as blast gates, hoods and hose adaptors, are widely available from vendors such as Rockler Woodworking & Hardware and Penn State Industries. For small shops, a viable alternative to PVC pipe is to use one of almost two dozen flexible hoses offered by Flexaust. Used to connect individual machines to a system, and also to work around physical impediments, many of its products have built-in ground wires. Speaking of grounding: When it hasn’t been done right and a spark is generated, there is one last wall of defense. 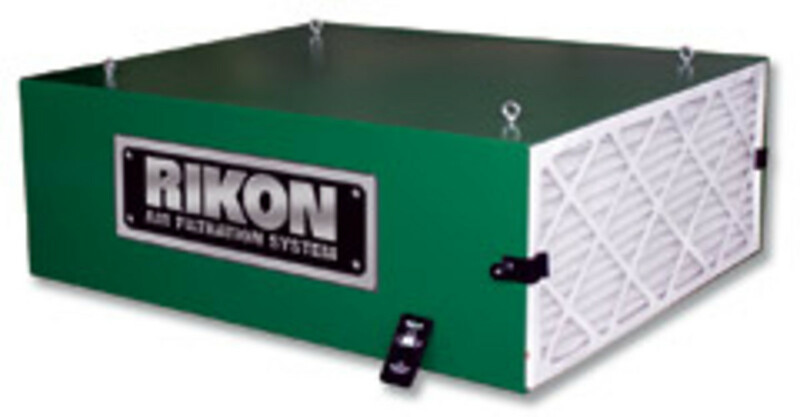 Integrated spark and fire suppression systems from companies like GreCon Inc. are designed to detect fires in the early developing stages and extinguish the flames before they can escalate into potential dust explosions. A dust collector and ductwork, no matter how big, isn’t a complete system. Catching fine dust at its source is paramount, and one way to do this is to equip the shop with tools from a manufacturer such as Festool USA that treats dust collection as a primary design factor, not an afterthought. Another efficient control method is using downdraft tables available from Denray Machines, SandMan Products, Grizzly, Jet, General and other manufacturers that help eliminate harmful fine particles at their source. Once they get away, the only other way to round up fine particles is to install one or more “air scrubbers”, such as the air filtration system units from Jet. These are three filtration units (1,000 cfm, 1,300 cfm and 1,700 cfm) that are suspended from the shop ceiling and use a fan to circulate the air in a room and then trap fine particles in a series of filters. This type of filtration can be a lot more effective if one can reduce the cubic volume of air that needs to be scrubbed. One relatively inexpensive way to do that is to temporarily partition off the dusty area of the shop with barriers such as curtain walls from Goff’s Enterprises. These walls not only help contain sawdust, they can also be used to control the shop’s ambient temperature, noise levels and work flow. 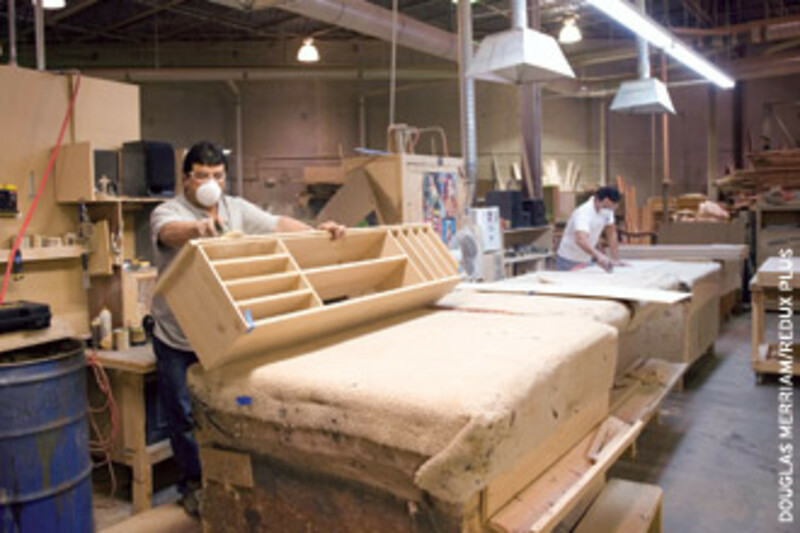 But their biggest advantage is that they can help improve air quality for both workers and finishes. If machines in a system aren’t producing debris, but their ports remain open, the dust collector is being asked to pull clean air along with contaminated air. This increased volume reduces speed and efficiency. Manual blast gates work fine for a small shop, but automatic blast gates are essential in a bigger environment where more than two or three machines will be run simultaneously. Unfortunately, there’s a potential downside here: the collector requires a minimum amount of airflow to work and, if all the gates but one are closed, it might not be getting enough. It’s not a good idea to ask a big fan to pull a very small volume through a single duct. The biggest problem with filter ratings is that they change every time the collector is run. Some debris lodges in the filter wall — even after cleaning — and this fine dust actually closes down the holes in the fabric. So a brand-new filter bag allows bigger particles to escape than one that has been through several cycles. As the holes close, the airflow slows and backs up, and the entire system moves less volume. On the other hand, it also collects more of the smallest (most dangerous) particles. Some experts feel that a collection system that traps large particles in its first stage and exhausts very fine particles outdoors in the second stage (with no filters) is the most efficient. However, in climates where heating and cooling are essential, treating new air that makes up for the exhausted volume can be quite expensive. Fabric bags require constant maintenance. If they are not equipped with agitators (and most home-shop ones aren’t), then they need to be manually shaken daily before the collector is turned on. This helps reduce the “cake”, an accumulation of fine dust on the inside surface, and allows the fabric — and the woodworker — to breathe better.